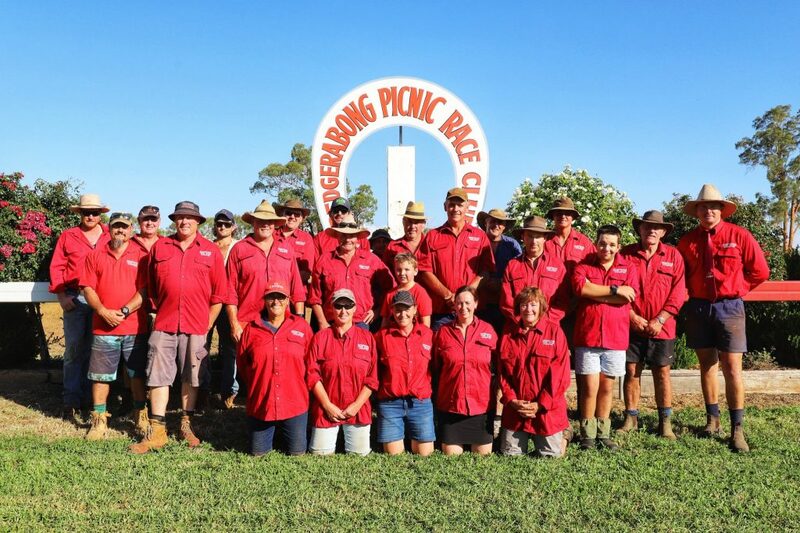 The Bedgerabong Picnic Race Club is a member of the NSW Picnic Racing Association. We are registered with Racing NSW which enables us to access all the services associated with thoroughbred racing in NSW. The Bedgerabong Picnic Race Club was established in 1919 with a handful of local volunteers from the Bedgerabong community decided to run an amateur thoroughbred horse race meeting. 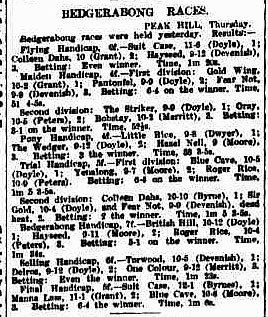 Race meetings were held on a number of local properties before it found is home at the current location for the Boxing Day 1933 Race Meeting and continues to race there today. Here is an excerpt from the Sydney Morning Herald (Friday 4 May 1923) with the results of the races! Our Club, has an Executive Team and Committee of more than 50 volunteers. This is quite unique and shows the wonderful community spirit that still exists in Bedgerabong, along with many other small country towns in New South Wales. Photo taken 2 February 2019. A strong committee of locals runs the Bedgerabong Race meeting and in 2007 we were awarded Community Race Club of the Year by Racing NSW. Angus Bird, Tara Bird, Ian Brockmann, Bill Brown, Daniel Brown, Kelvin Brown, Peter Charleson, Nathan Clarke, Dan Colley, Darren Collier, Alex Constable, Arnold Constable, Joe Constable, Peta Constable, Russ Constable, Tim Currey, Rebecca Dance, Paul Darcy, Nelly Dukes, Hugh Ellis, Darren Gannell, Fay Green, Tayler Green, Bradley Harrison, Angus Herbert, Laurie Hocking, Colin Hodges, David Hodges, Frances Hodges, Greg Hodges, Kerrie Hodges, Mark Hodges, Neil Hodges, Michael Jeffery, Darcy Mannion, Alan Marsh, Andrew McKeller, Natalie Ostler, Nathan Ostler, Jimmy Rodgers, Simone Rodgers, Chris Simmonds, Ian Simmonds, Tom Simmonds, Robert Speed, Barry Straney, Gary Straney, Graham Whiley, Michelle Whiley. We would like to welcome our newest committee members and thank those who have had a long association with the club. If anyone is interested in joining our committee please contact the president. Our Life Members and Patrons are a very important part of our club. These people are truly treasured, and have been honoured with this title due to their many years of work and dedication to the club.